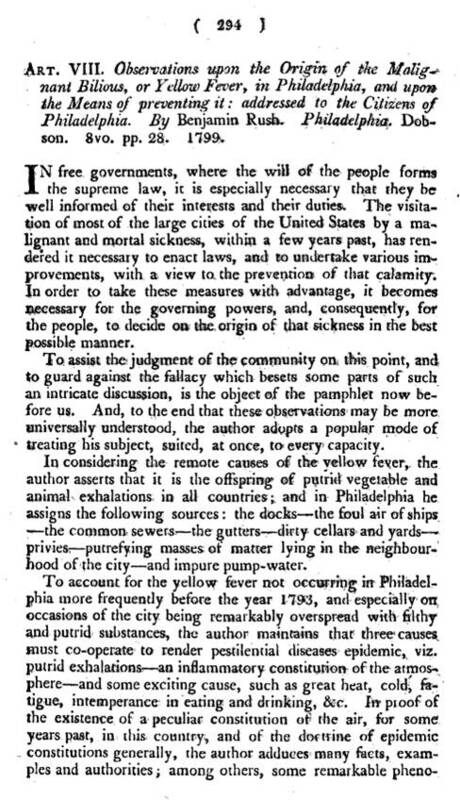 The differences in opinion that existed between New York and Philadelphia physicians following the return of yellow fever in 1797 were more a product of personality and ego than a result of right versus wrong. Neither of these teams of physicians had an understanding of yellow fever and its causes, and neither were even close to realizing that yellow fever was a disease brought into this country by ships, due to the mosquitoes on board. The reasons for this lack of understanding and long-lasting lack of discovery related to the cause–a virus residing within the mosquito. This virus was too small to see as some sort of animalcule, so it would remain in hiding for most of the 19th century. The next level up for understanding the cause for yellow fever–an understanding that the mosquito carried the substance responsible for this disease–was equally misunderstood. The mosquitoes themselves weren’t well differentiated into their various species. One mosquito was as good as the next when it came to recognizing any mosquito related cause. 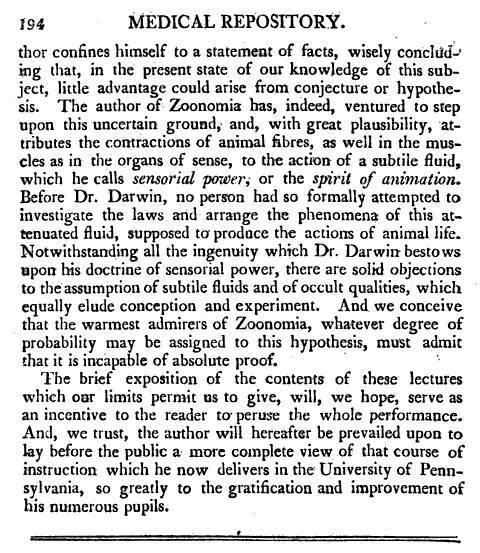 Equally misunderstood were the numerous other examples of animalcules out there that could be the cause for a disease like yellow fever. The recognition of animalcules identified as worms was fairly concrete in its nature, worms were visible enough to be differentiated from each other to some extent. Likewise, for other insects out there possibly related to disease, such as the flies, ticks and fleas, it was difficult for physicians to imagine the differences between insects as carriers of disease, with just one type of insect carrying just one type of disease. 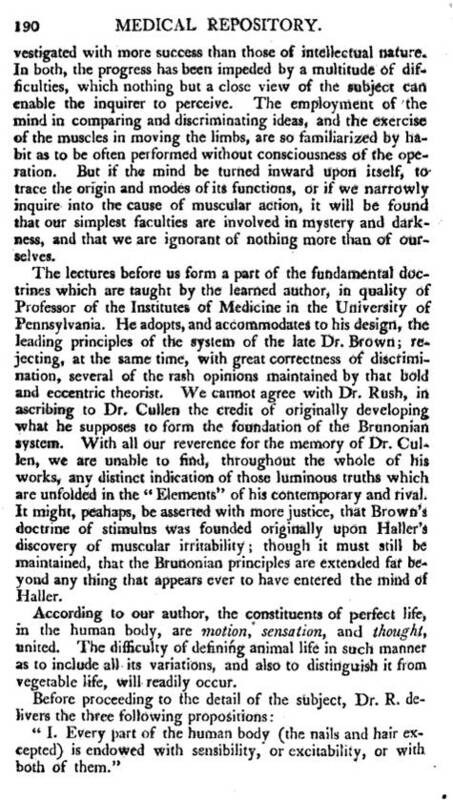 When Samuel Hahnemann, the founder of homeopathy, gave his impression of the insects as disease carriers, he stated that some flying insect could very much be a cause for illness, but in his theory defined the insect as so small that it was in essence invisible to the naked eye, forming a cloud or miasmatic like substance in the air that enabled diseases to be spread. There were two questions about diseases at the time of Rush’s writing that had to be answered. First, was the disease airborne or was it transmitted by some other means such as water, contact with certain materials, or by way of animals. Second, was this substance being diffused about of local origin, or was it brought in from another location, and then able to diffuse about a region. 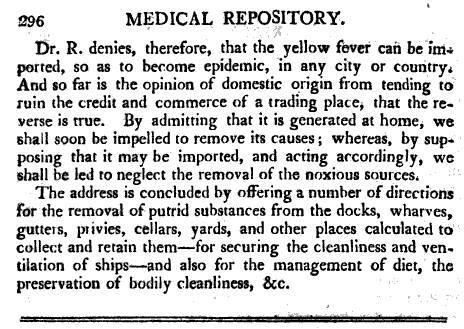 Evidence regarding the circumstances of its introduction to an area and the manner in which it was spread, from one type of individual to another with a special relationship with the causes being considered, pointed to the possibility that something like ballast water or some other substance on board a ship brought the yellow fever into the region. But equally blamable were the poor and unsanitary conditions that existed in the shipping docks. Add to this the poor lifestyle many ship workers lived, and the overall unhealthiness due to rancid products on board and limited food and water supplies, and you also have the evidence needed to blame the people on board for being sick, as a result of the shipping environment itself, and nothing to do with its ports of origin. 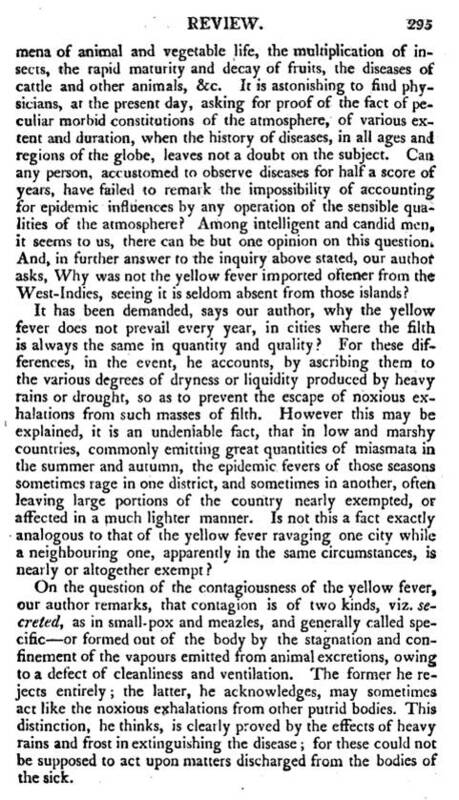 This latter situation is what made Benjamin Rush so certain about his observations, conclusion and theory about yellow fever developing due to the conditions locally instead of abroad from another country or due to the mist at sea. 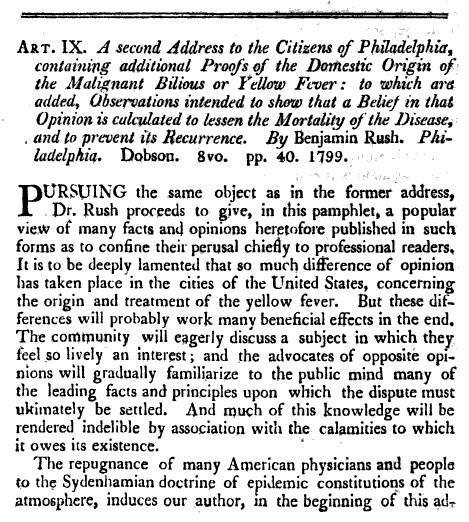 Benjamin Rush’s theory for yellow fever was that it was local in origins and related to unsanitary living conditions. Many diseases at this time were blamed on local causes like rotting vegetable debris and aquatic life in the harbors, the rotting detritus and plant matter floating in swamps and bays nearby, the remains disposed of by people and businesses like the local butchers throwing away their scraps and skeleton remains and farriers tending to their stock. Rush’s theories for the causes were unique in some cases–he liked to blame the stench released by imported coffee beans gone bad following a long trip. 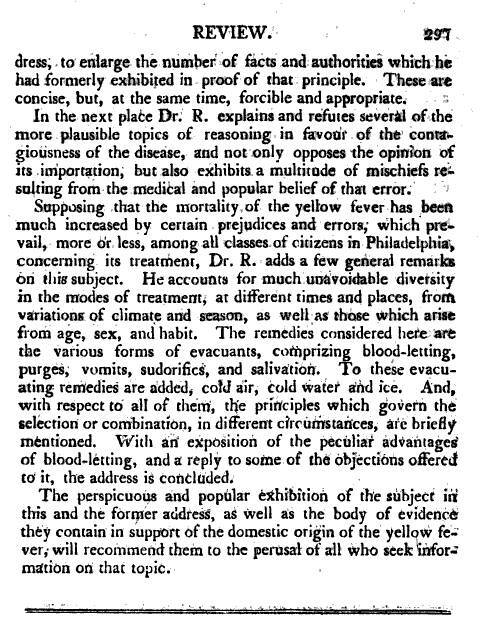 During the late 1700s and very early 1800s, yellow fever was a disease restricted to the Americas and just its hemisphere. If we consider what this means to an epidemiologist during the time, it means that it probably shouldn’t be considered an ocean born miasma, since there is little logic to the idea that a miasma could only strike one hemisphere of a rotating planet. This meant the epidemic was to be blamed on just America. The seasonal migration of yellow fever from the tropics to the temperate zones by late summer suggested that temperature had much to do with its diffusion patterns. But there was no consistency as to where this disease would strike next. During one year it could attack Philadelphia in the worst possible way, skipping New York altogether until the following year. Just outside the region of these two major cities were Baltimore to the south and Providence and Newport to the east and slightly north. These cities also had their own schedules regarding when the yellow fever was introduced. So there was no logic to the geography of this disease other than its tendency to remain along the shorelines. Complicating this rendering of how the epidemic behaved were the observations about the disease striking the interior of this country, the first of such cases they signed off as other events such as the Genessee Fever and Lake Fever which are discussed elsewhere. 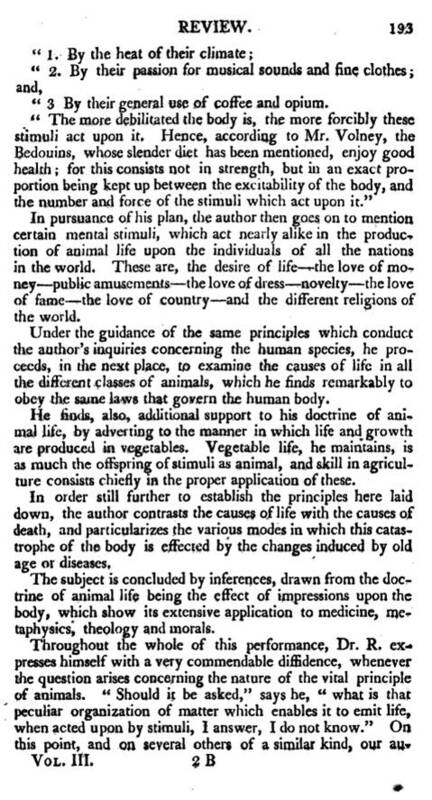 The truth about the manner in which yellow fever came to this country was therefore hidden from most medical geographers due to their focus on the natural elements like weather, topography, soil, climate, local temperatures, humidity, wind flow patterns, vegetation, type of land use mostly engaged in, the formation of natural rotten debris or detritus, swamp formations, natural cave formations, local thunderstorm and lightning patterns, recently fallen meteors and comet behaviors, earthquake activity, new cave formations, and other possible links to the main cause–miasma, be it from the surface or the interior of the planet. Everything was considered to be the main cause for yellow fever, except for people and on and off the animalcules that should have been suspected and then truly blamed. The closest physicians were to uncovering this truth pertained to their work as early hygienists and sanitation specialists. Ultimately, it took the initiation of a standard and highly effective quarantine practice to demonstrate that yellow fever was introduced by ships, not by the local surroundings. Then the question became ‘why does it continue and infect new people.’ The pursuit of an answer to this question is what drove so many epidemiologists back to the local theories for disease, a habit they passed along to the next plague or pandemic to strike this country, the Asiatic cholera, which Western Europe also became a victim of. The European disease geography philosophy influences the bulk of the world following the 1829 and 1848 cholera pandemics. The following articles present us with Rush’s position about the causes for yellow fever. 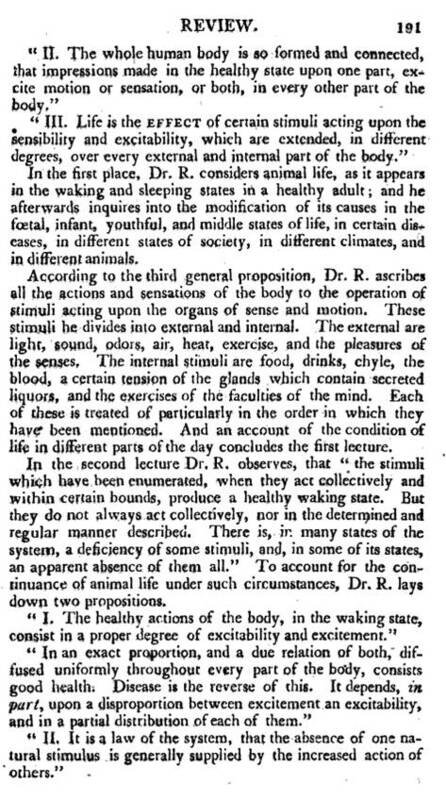 This theory would quickly give rise to a conflict between Rush and several physicians in New York, but most Samuel Mitchell. In a way, Valentine Seaman’s production of the first map depicting this local disease for New Yorkers came to be due to Rush’s insistence and Mitchell’s imagination. The dispute as to who was right and who was only partially correct was now documented on paper, with the city of Philadelphia slightly ahead of New York from this point on in several ways. Philadelphia had Rush and his Constitutional fame. New York had Samuel Mitchell with his knowledge and creativity derived fame. Rush’s theory to some may have been old-fashioned and directed to the wrong conclusions about a cause for yellow fever. Mitchell’s theory at first was basic, but then added a new theoretical substance or phlogiston representing the theoretical cause for this disease. Neither were correct in the end, and none any closer than the other regarding the true cause for this fever. The most correct writers defining a possible cause for yellow fever were those lesser trained or even untrained onlookers and observers of this disease. Ship staff, residents, and other non-medical people were rightfully suspicious of the small animalcules associated with the ships. But their suspicions were never heard by the more elite members of the medical profession. The following articles written by Rush detail his philosophy for the time. This does change over time, however, as one strong Rush supporter likes to point out to me every now and then. 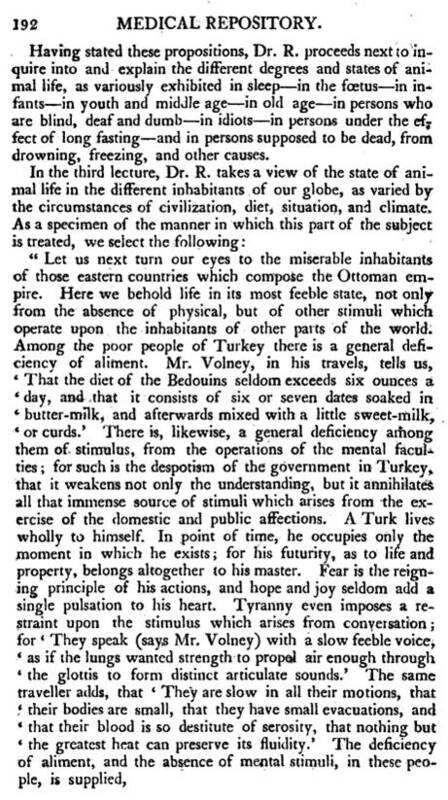 These are from the 1805 volume (Vol. 3, New Series) of the Medical Repository.